After an unnamed woman anointed Jesus’ feet, he said, “Wherever the good news is preached in all the world, this will be remembered of her.” His words continue to ring true today about women of every culture and religious tradition. This Will Be Remembered of Her is a book about hope, courage, imagination, and compassion flourishing amid the challenges of daily life. Megan McKenna looks at the inspiring lives and words of notable women from both the past and the present, holding them up as examples of how a passionate desire for justice can shine in our hearts and our deeds. McKenna weaves together three strands — stories from Scripture, stories of select women from around the globe, and stories from religious, folk, and wisdom traditions worldwide — into one strong braid of how life can be made more compelling, more communal, and more just for all people. She juxtaposes biblical women and contemporary women, exploring the reasons why each woman has been remembered. 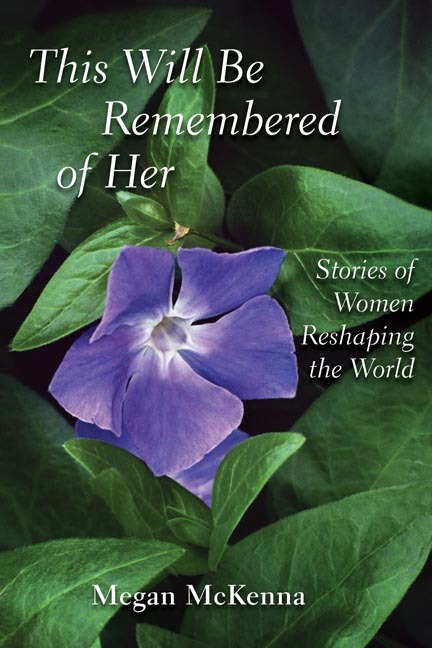 In the end she asks her readers this important question: How will you be remembered? $15.00 Paperback; To order, click here. To read full review, click here. In the realm of the Spirit, and when dealing with our own souls and the souls of others, we are often at a loss for words. We have a sense, maybe even an image of what we want to share, ask, or communicate, but words are harder to find and express. Stories are the glue that hold us together in whatever groups we belong to, even if we only visit or find ourselves on the margins. In a sense, our God is a story being told and God is seeking for all of us to listen, to enter into the story and become one. In this book, Megan uses images of Russian nesting dolls to illustrate the many layers of the stories that exist in each of our lives, particularly in relation to the Spirit. Stories are critical to living and are intertwined with truth in such a way that we can carry them with us, remember them and pass them along, sharing them as needed. We live inside a story. We live inside God. Harm Not The Earth is a wake-up call which tells us that it is time to start bearing fruit, not for personal sanctification or salvation, but for the good of all. The author, Megan McKenna, tells us that if we are to be the followers of Jesus who is the fullness of life and sanctuary for all, who loved gardens and mountains and the sea and prayed that we might all be one in God as God is in us, then it is time for us to shift our attitudes towards who we think God is, what we think we are on this earth for and what it means to live and be responsible for creation ‘in the image and likeness of God’. Pope John Paul II referred to Mary as the Mother to All and Mother Forever. The faithful know they can count on the heavenly Mother’s concern and that Mary will never abandon them. By taking her into our own home as a supreme gift from the heart of the crucified Christ, we are assured a uniquely effective presence in the task of showing the world in every circumstance the fruitfulness of love and the authentic meaning of life. For Christians of our time, Megan McKenna explores the meaning of the blessings and woes pronounced by Jesus on the plains of Galilee. She calls us to the heart of the gospel and to be converted to discipleship in Jesus’ kingdom of God. 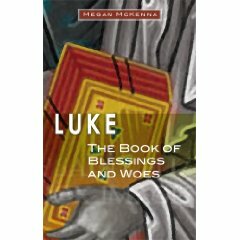 In Luke: The Book of Blessings and Woes readers learn about Jesus’ teachings through his parables as well as through insightful stories about Zen masters, Jewish rabbis, Japanese gods, Sufi mystics, and stories told by well-known figures such as Thomas Merton and Leo Tolstoy. We learn that compassion, the source of blessings, means being with others in their pain and suffering and knowing their pain as our own. Order your copy at a savings of $6.38 by clicking here. To read the New Theological Review (Feb. 11, 2011) review of this book written by Timothy A. Lenchak, S.V.D., click here. The Hour of the Tiger: Facing Our Fears is about the present moment – every moment. It is about facing life and death, fear and love; about facing all the hard issues of life and all the mysterious, deep places of living. Spirituality and Practice review of The Hour of the Tiger, click here. Buy now from: Center for Creative Alternatives (201-393-7617; CCAMcK@cs.com); $20 +shipping.